In the spirit of the holiday season, the Baylor family is filled with gratitude for all that our university represents. 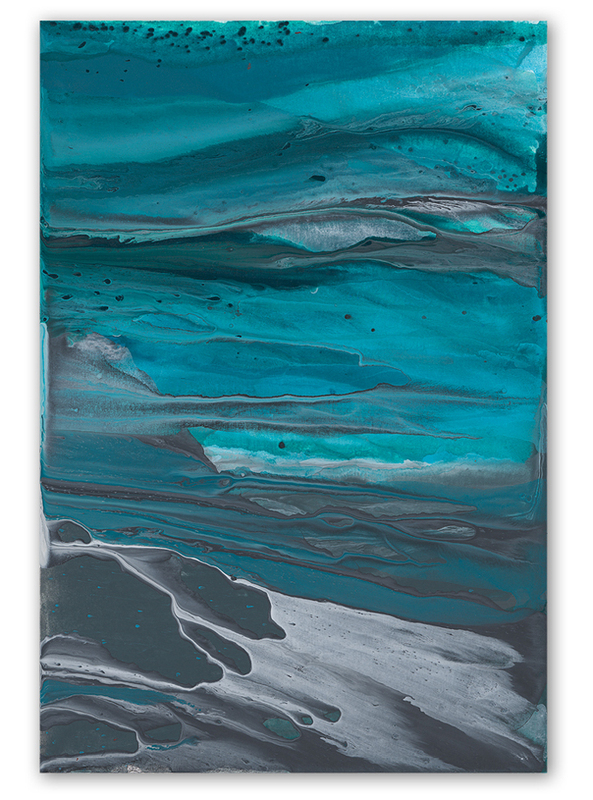 Art Inspired by a Thankful Soul was a juried art contest held at Baylor this fall in which students were invited to share how they have been inspired by their experiences at Baylor through an original work of art. The response was tremendous, resulting in a vast array of creative and meaningful submissions. From these, a distinguished jury -- hosted by Baylor First Lady Alice Starr -- dubbed two exemplary pieces "Best in Show." These winning works and other selected artwork will be shared with the Baylor community in an exhibit beginning January 2012 in Moody Memorial Library. Here, we offer a preview of the student artwork, accompanied by the corresponding artist statement, to celebrate our students and inspire your thankful soul. I am incredibly thankful for Baylor for many reasons; however, one of the biggest reasons is that my ability and love for art has been honed and nurtured here into something better. This is thanks to the support of my professors, the many hours spent in the art building and especially a wonderful painting class that I took here at Baylor two years ago. I painted my first painting (the one I am submitting now), and it is through it that I found my passion for illustration and dream of becoming a children's book illustrator. This painting symbolizes me, a "flower in bloom," because I see all humans as flowers--each unique, beautiful and in their own season of growth. And this is simply where I am right now, a flower in progress--unraveling, always changing and a little bit unsure, but well-tended to, full of life and love, and ready to embrace the next season of life that, if the Lord allows, awaits me. Thank you, Baylor, for being an important and beautiful part of my journey. "When I Consider Your Heavens"
This past winter marked the end of a long depression and "spiritual dry spell" for me. 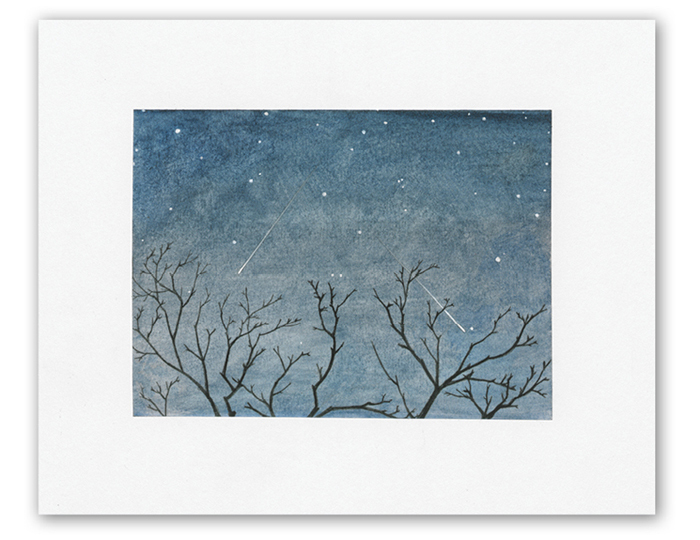 I saw meteors on several different occasions (twice while on the Baylor campus), and they seemed to represent the glory and vastness of God--a new beginning and hope. Witnessing these events coincided with my decision to transfer to Baylor this past spring--a choice that was greatly influenced by the strong spiritual life on campus. This piece was part of an unfinished series that attempted to convey the intense spiritual character of nature and how I felt in those winter months prior to starting at Baylor. I am truly thankful for the spiritual nourishment Baylor has provided and the people who have made it possible for me to attend. This painting was made with gouache and watercolor paints. This photograph was taken while I was on a Baylor medical mission trip to Kenya during the summer of 2010. I had a day off from doing medical work, so I decided to go to one of the local schools to see how it was run. I was shocked at the enthusiasm and eagerness of the students to learn. 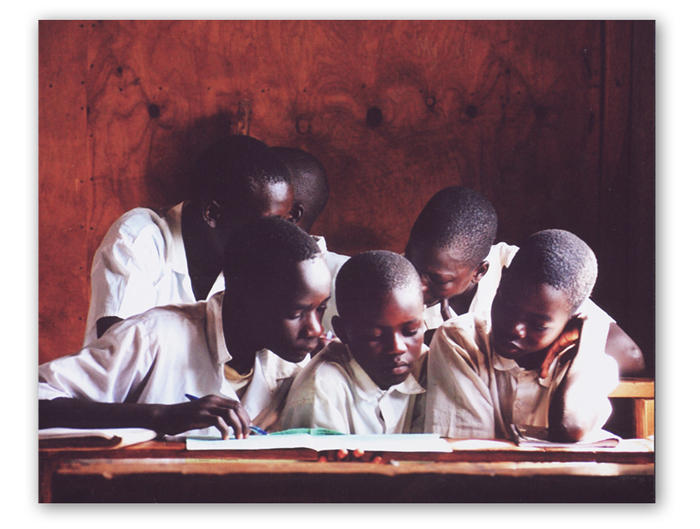 I captured this moment of the students huddling around a book, thriving to gain knowledge. I love this because this is how we are as Baylor students, eager to learn and further our knowledge. I see this image as a representation of how, even though my time in college has included a heavy load academically, emotionally and spiritually, my professors and friends in the Baylor community have continued to uplift me, making me feel weightless no matter how heavy my burdens. 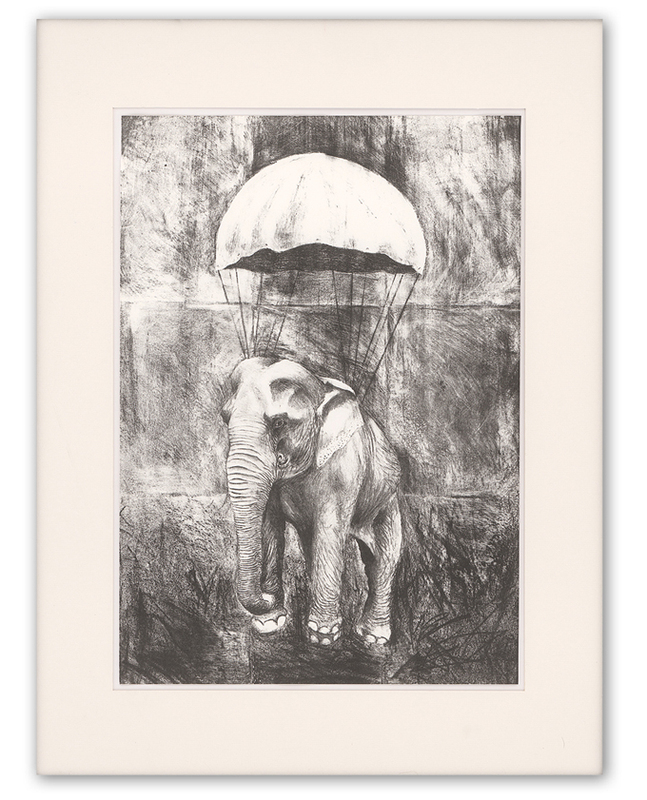 I made this lithograph as a visual reminder of what my time here has taught me: Nothing is too heavy or too great for God, the Creator of all things. 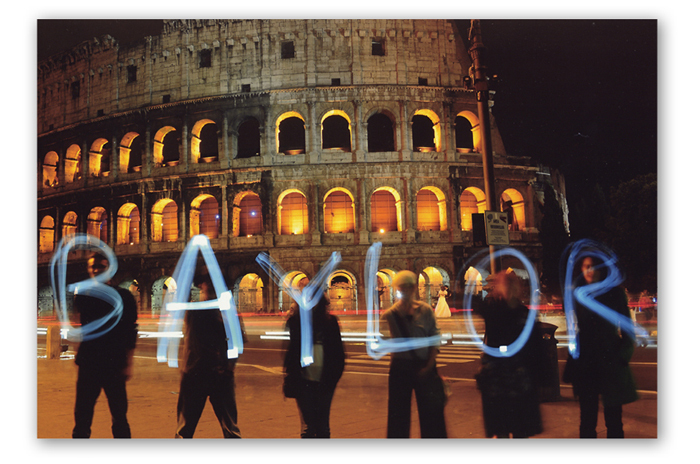 "Baylor Students Light Up the Night"
On the Baylor Theatre Abroad trip in the summer of 2010 to Italy and England, some friends and I were exploring Rome when we were struck by an idea. Having seen a photo from Baylor Theatre's trip to Paris two summers prior in front of the Eiffel Tower (taken by New York freelance photographer Sam Hough, BFA '09), we decided to recreate the photo in front of the glowing Colosseum. Using cell phones and a long exposure setting (and even borrowing a tripod from a kind street vendor), we finally got the shot after many failed attempts. A small crowd of locals had gathered by the time we were done, so we were able to show them our results and fling our green-and-gold Baylor pride to the northern Mediterranean. My friends and I were so inspired by our tremendous opportunity to study abroad with Baylor professors, learning about our craft and sharing timeless memories that we had to do something to commemorate Baylor's special place in our hearts! I came to Baylor last year, and I thought about water often. In the beginning, it was about drowning emotionally, spiritually and physically. My father died just before I came to Baylor. During the year, I experienced God's healing through friends who had become my family; water became about life, freedom and renewal. This painting represents that journey. I used washes of acrylic paint carefully mixed with water on canvas. I subtly controlled where the paint went while also letting it do what it wanted to. I felt free while painting this and wanted the painting to reflect that. The technique I used gave this painting the life and movement that it expresses. 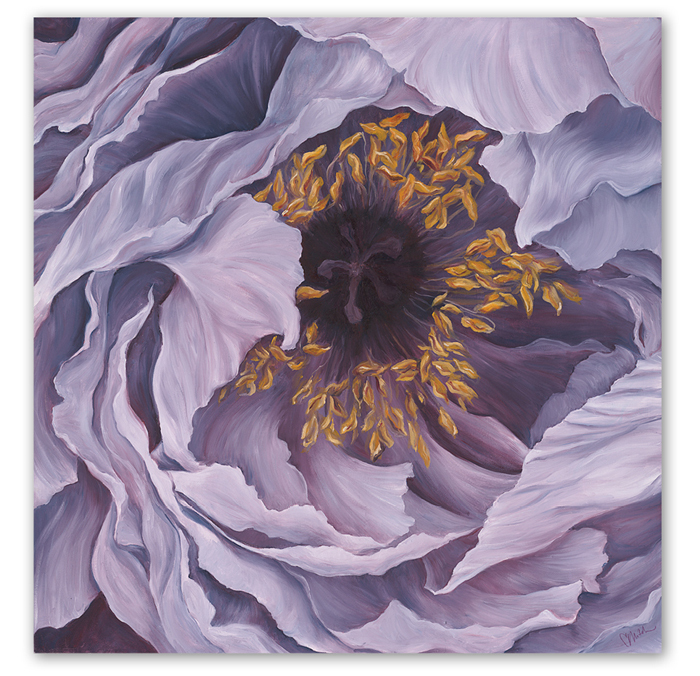 "Purple Poppy" is an expression of excitement and growth. My painting professor, Karl Umlauf, who has been a constant source of support and encouragement to me during my years as an art student at Baylor and to whom I am most grateful, inspired this piece. 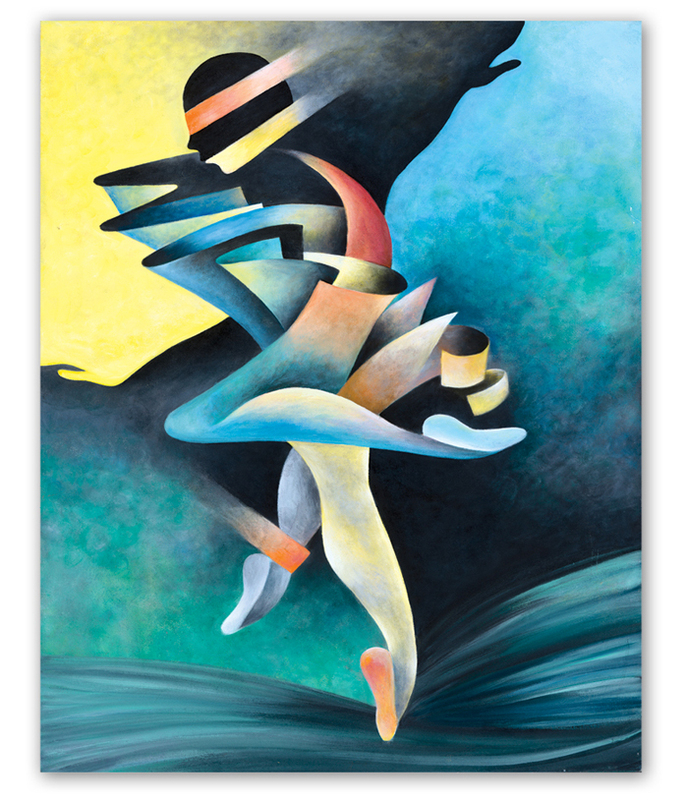 To create movement within the painting, I made sure the brush strokes corresponded with the values and tones of color I used. Oil on canvas.